Some parts of the program appear to have been left unaltered, such as light tables and web pages (aside from the fact that you can now easily upload your shots to Facebook and Flickr). Books offer different sizes, such as the new extra-large option and more themes, but they look more or less similar to what was available before. The main difference is that you’re no longer tethered to Apple’s layout choices: you can now create books using templates from other companies. These options are available as plug-ins, which show up in the Book Type pop-up menu when installed. One huge leap forward, though, lies with the slideshows. They’ve been completely revamped and bring in many functions and effects from iPhoto and iMovie, along with a few others of its own. If you’re in a hurry, you can choose from six different themes where everything is decided for you. Should you have time for more control, going with the ‘Classic’ or ‘Ken Burns’ theme lets you select which transition to use at any given time, how the Ken Burns effect is applied (in a very iMovie-like way) and even how long each photo stays on the screen. There’s an even quicker way to do this last action: switch on the Recording mode and hit the Spacebar to play your slideshow. Each time you then hit Return, Aperture will move to the next slide and record the time you wished the slide to be displayed for. You can also add video, text and audio to your slideshow as well. The Raw engine has been rewritten – again. In fact, you can no longer choose which engine to work with as you could in the two previous versions. It’s now version 3 or nothing. But this new engine offers a lot more versatility than before, like the inclusion of support for lens correction adjustments that would not have been possible without it. It will also enable the program’s support for the new Micro Four Thirds cameras in the near future. Aperture already had impressive adjustment tools, but they’ve become even more powerful with the introduction of Brushes. You can alter specific sections of a photo rather than being forced to use an adjustment to modify the entire picture, as before. 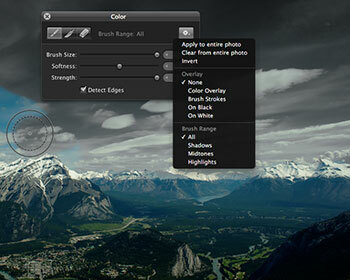 You can also add multiple instances of the same tool to affect different areas of your image in different ways. Like all other default tools, these are non-destructive, enabling you to tweak them or remove them entirely at any time without ever altering the original image. So you could improve the blues only in the middle of your photo, or tweak the highlights and shadows only around a person’s face, or modify the contrast and saturation of a single rose.